Maximum size: about 11 mm. Identification: This is a flat species with small, irregular papillae tipped with cream. 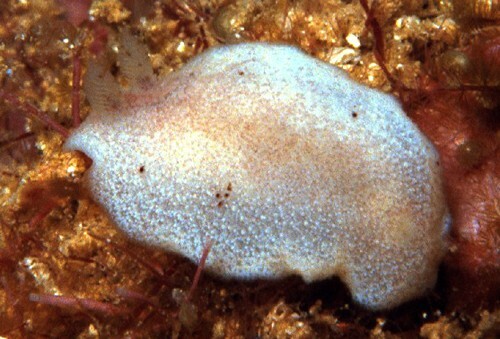 There are a few scattered dark brown papillae and the rhinophores have a few brown flecks. Natural history: Paradoris sp. #1 is known from only three animals. The two found by Scott Johnson on Oahu were at highly exposed rocky sites. The other was found at 9 m (30 ft) at Kahoolawe. Taxonomic notes: This is the unnamed Paradoris represented by the specimen CASIZ 072185 in Dayrat (2006). It was first recorded in Hawaii from Kaena Point, Oahu by Scott Johnson on July 19, 1984. Photo: 9-11 mm: Scott Johnson: Kaena Point, Oahu, July 19, 1984.